We know Stephen Curry is superhuman, but what else did we learn from Warriors-Thunder (other than that Oklahoma City blew it)? 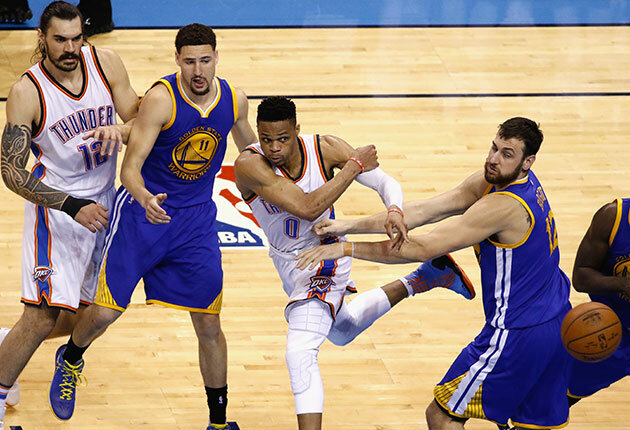 What just happened between the Warriors and Thunder was as good as it gets. That is typically a throwaway compliment we make in passing, but it's offered here literally. There was history on the line, there were massive personalities, there were fascinating tests for three or four of the best players of this generation, and there were at least four or five times when this series made every expert look stupid. It was beautiful. I was supposed to write about the NBA Finals this afternoon, but that can wait a day or two. We need to give a little bit more love to the Western Conference finals. 1. Russell Westbrook pushed this series to a different place. First of all, he's the perfect foil for Steph Curry. As the Jordan Brand ad reminds us, Russ is not just another choir boy point guard. Where Steph glides, Russ explodes. Where Steph shoots, Russ dunks. Where Steph makes plays that leave you laughing in disbelief, Russ highlights will make you want to bench press a parked car. And for the first five or six games of this series, he battled the best player in the world and won. The Curry-Westbrook matchup was so lopsided after four games that half the NBA world wondered whether Curry was hurt. If the Warriors spent half the series looking dazed and inexplicably worn out, it wasn't because they'd chased 73 wins all year. It's because they were playing Russell Westbrook's Thunder. Russ failed in the end. He pressed in the fourth quarter of Game 6, with four turnovers in the final five minutes. He lost control in the second half of Game 7, and the Thunder only made it close when Kevin Durant went on a 7-0 run late in the fourth. He had three spectacular games, but he needed four. All the flaws that have doomed Westbrook in the past came back to haunt OKC's offense again, and as the series went deeper, Westbrook began to look less invincible. That's partly a criticism of how he finished, but also a tribute to how great he was as OKC went up 3-1. His Game 4 performance—36 points, 11 rebounds, 11 assists, and four steals in a 24-point win over the best team in basketball—might be the best game we saw from anyone this playoffs. If the end of this series means the legend of Curry and the Warriors looms even larger, it means we should remember Westbrook, too. Westbrook might be the only guard on earth who could force Curry to find another gear, come back even tougher, and look even more unstoppable in the end. I love him for it. Styles make fights, and Russ's style next to Steph helped give us a classic. 2. Game 1 is when we should've known. Game 1 of this series feels like it was a month ago, but that's when it was clear the Thunder were different than any team we've seen against the Warriors. Most everyone else Golden State has ever played can be bombed into submission once shots start falling in Oracle. That's how the first half went in Game 1, and the Warriors went to halftime with a double–digit lead. But OKC wouldn't disappear. After every Warriors punch, Westbrook and Durant came back harder, and it turned a double-digit deficit into a Game 1 win. This should've tipped us off that this series would be different. People kept mentioning length as the biggest factor that threw the Warriors out of sync, and that played a huge role, but I think the utter lack of fear from OKC was just as crucial as any physical advantages. They honestly thought they were the better team, and they played that way. It's what leveled the playing field against the best regular season team in NBA history. From Game 1 and right up until the second half of Game 7, OKC was the first team we've ever seen that was completely unphased by everything that makes the Warriors great. 3. Build Steven Adams a statue. Whenever they build the Steven Adams statue in Oklahoma City, it should be 150-feet tall. Also, it should probably be surrounded by flames. And a moat. Make it a national monument that we can all visit. That's what he deserves after the past month winning over America. He's like a Game of Thrones character who can dunk. He's also only 22 years old. I'm not telling Thunder fans to feel good about the way this series ended, but between heartbreak and Kevin Durant angst, there should at least be a little bit of room for Steven Adams euphoria. 4. When the Thunder took that 3-1 lead, it almost made sense. The best moments in sports are the ones that remind us that on the most basic level, we're all equally clueless. That was the first four games of this series. There were nominal explanations for what was happening to the Warriors, but none of that did justice to what we were watching. We'd spent all year nitpicking an imperfect Thunder team and worshiping a flawless Warriors team as the blueprint for where basketball was going, and over the course of a few days, everything we learned has been detonated on national television. There were explanations, but how do you explain an atomic bomb? There were people who said that some of these games weren't actually fun to watch—the blowouts in Game 3 and 4, specifically—but that's not how it felt. 5. Russ and KD flew too close to the sun. Every classic story needs a turning point, and this was ours. It was a questionable look at the time to make fun of Curry's defense—especially from Westbrook, who is very much living in a glass house—but it only got worse as the series unfolded. It was like Wade and LeBron making fun of Dirk Nowitkzi's flu. The question: "Obviously it's a tough night. Curry's shooting better, but he also came up with a big steal in the fourth. Do you think that he's underrated as a defender?" Durant: "I mean, getting steals, I don't know if that's just—that's a part of playing defense, but he's pretty good, but he doesn't guard the best point guards. I think they do a good job of putting a couple of guys on Russell from [Klay] Thompson to [Andre] Iguodala, and Steph, they throw him in there sometimes. He moves his feet pretty well. He's good with his hands. But, you know, I like our matchup with him guarding Russ." This is all well and diplomatic, but to truly appreciate the disrespect, you have to imagine them talking about another superstar this way. LeBron's defense is beyond reproach, but what about Carmelo Anthony? James Harden? Damian Lillard? There are so many players who are half as accomplished as Curry who'd never have their defense openly questioned in a press conference. For the record, I loved it. I also don't think it changed the series, because this was bubbling beneath the surface the entire time. This kind of coded skepticism and passive aggressiveness is how superstars all over today's NBA have responded to Curry for two years. 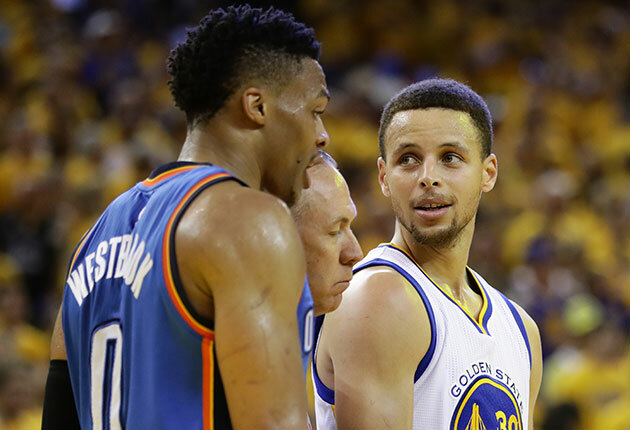 Oscar Robertson is one thing, but Curry's own peers aren't ready to concede anything. It's been a subplot around the league the last few years. And on the brink of Golden State's collapse, we got to see Durant and Westbrook take it mainstream. It raised the stakes for everything that came next. Whether Curry won or Durant and Westbrook finished the Warriors, someone was walking away humbled like never before. 6. Klay Thompson went into God Mode. And so, in the middle of Curry and Durant and Westbrook, we forgot about Klay. Saturday night was the reminder that President Obama wasn't wrong when he said Thompson has the prettiest stroke on the Warriors. And in a year that unquestionably belonged to Steph in God Mode, Curry was bailed out by his teammate going supernatural. Klay deserves an appreciation of his own, but he wasn't the only Warrior to come up huge down the stretch of this series. Andre Igoudala's defense on Kevin Durant was just as crucial in Game 6, and Andrew Bogut's rebounding in Game 5 gave the Warriors just enough room to survive. But it was Klay who provided the kill shots. Curry showed up, too—31 points, 10 rebounds, nine assists, and several gigantic shots in the fourth in Game 7—but none of this happens with Klay Thompson in Game 6. His release is the fastest on the planet, his defense is great, but Game 6 was when the details didn't matter and we were all amazed by the bigger picture. 7. The Thunder went to Sisyphus Mode. Yes, we did just compare Durant and Westbrook to a different Greek myth, but Sisyphus works, too. In fact, that combination of Icarus and Sisyphus is probably the most accurate way to describe this team. For the last five years, the Thunder were stuck in an endless loop, trying to conquer the flaws that come with relying on two superstars so good that they almost make chemistry irrelevant. Durant and Westbrook couldn't put any offense together down the stretch in Game 6, and the same thing happened in the second half of Game 7. This is how the playoff runs always end when both players are healthy. 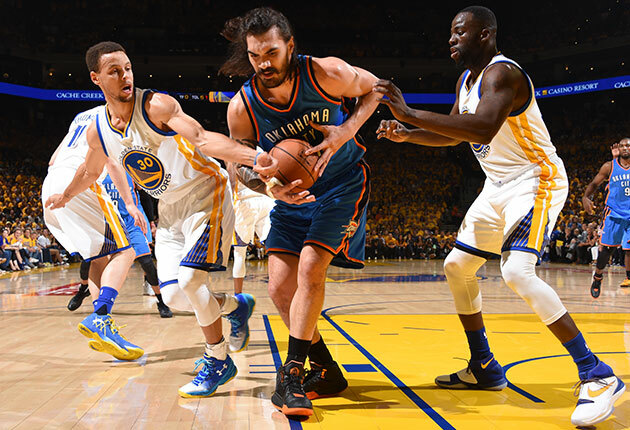 For a while it looked like they were so overpowering that they'd avoid close games altogether, but once the Warriors started making shots and took away fast breaks and refused to disappear, OKC had to win in the halfcourt, and it got complicated. The late-game issues are less a glitch and more a feature of this OKC machine. Any team that asks two superstars to trade off crunch-time possessions is going to have trouble getting either of those players into a rhythm as the game gets tight. It's why the Thunder have always had trouble, and why it's fun to root for them to be so dominant despite it all. That's what they were doing in this series, proving everyone wrong, right up they until they weren't. Now we're back to square one, loving them even if it didn't work. There was some debate about whether the Thunder "choked" here, and it's fair. They had every opportunity to bury the Warriors, and then when things got tight, they fell apart. The Warriors are so good that they can make even the best teams look flawed. 8. Don't let Steph get in that zone. 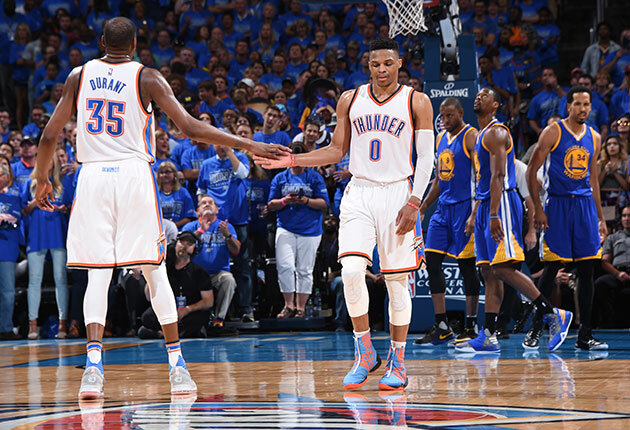 "He scored a lot on our bigs," Russell Westbrook said after Game 7. "He did a good job of making some tough shots over our bigs. Our bigs on the switches came out and he made some tough shots over the top of them." Yes. Russ is correct. One of the most evil Steph Curry qualities is what he does to big men who get lost trying to guard him on an island off a pick-and-roll. It started in the first few games when he'd isolate Enes Kanter. It's like something would click mentally, and knowing he had that extra bit of speed as an advantage would give Curry a little more confidence, and it guaranteed he was about to drain a stepback. That's the extra 30% of confidence he's been playing with all year. It's what separated him from every other player in the league this season, and even from the MVP year he had last season. It continued last night, as he abused Steven Adams over and over again on the perimeter, and eventually turned to Durant and Westbrook. The confidence disappeared during the middle of the series, though. In retrospect, we can say with reasonable confidence that Steph Curry wasn't hurt, but he was definitely shaken up. We could see it. He was passing when he was supposed to shoot, he was driving when he should've pulled up (and vice versa), and he wasn't punishing big men off switches. It was jarring to watch. Then somewhere between the second half of Game 6 and Game 7, the confidence came back, and this series was over. Did you want an answer to Westbrook after that press conference about defense? There's been all kinds of debate about whether Curry is a "true" MVP, or merely a great player on a great team. But if that's still an argument, the first four or five games of this series gave us a hint of what the Warriors would look like with a very good point guard in Steph Curry's place. He made shots, he attracted extra defenders, but the insane confidence was gone, and the Warriors were suddenly mortal. Klay Thompson went off in Game 4, for instance, but without Curry to help finish the comeback, it wasn't nearly enough. Then Curry came back and relaxed, Klay kept going, and by the end, it all looked impossible again. The first four games of this series were stunning. But as it turned out the most amazing part of this series wasn't going to be watching a superstar suddenly lose the confidence that made him unstoppable. It was watching what happens when he gets it back.